Now that Christmas has passed and gifts have been given and received, I'm happy to be able to share these embroidered pillows that I made for my two sisters. 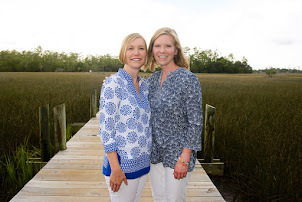 The letters B and G are for their last names. 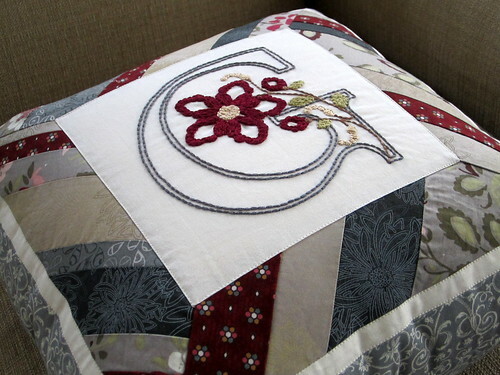 This project started with the B embroidery. I found the font pattern here, in the collection of flowered monograms from a vintage embroidery book, La Broderie Blanche, 1912. 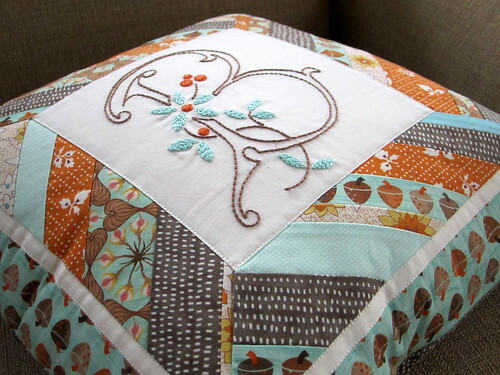 I chose everything in this pillow to coordinate with the acorn fabric. After I finished the embroidery panel, I considered a few different designs to frame it. I settled on this Sun Rays block design from Twin Fibers (tutorial here). I love the look of the mitered corners, and the strips allowed me to incorporate a lot of different fabrics to coordinate with the acorns. 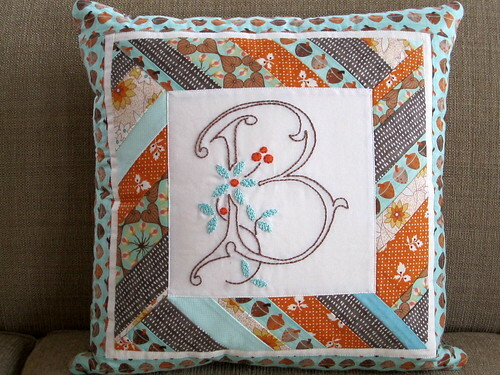 The back of the pillow is done in the brown with white hash marks. 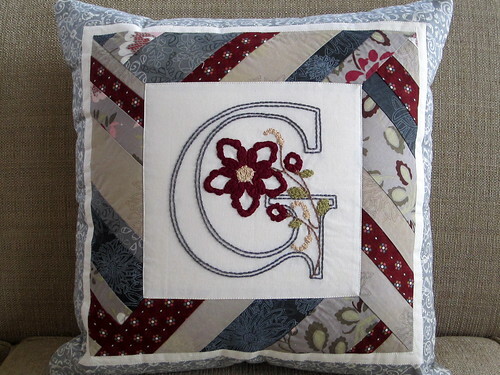 As I was working on the B embroidery, I decided to make another pillow with a G for my other sister. I decided to use a different monogram design (found here) and a different color palette. I tried to just figure out the hand embroidery as I went along, and this design required a lot of fill stitches. The fabrics in the surrounding Sun Rays block are almost all from a scrap pack that I received from Art Gallery Fabrics after I responded to a post about the giveaway on Facebook. Lucky me! The back of the pillow is the same grey scroll print that's just visible on the outer border. 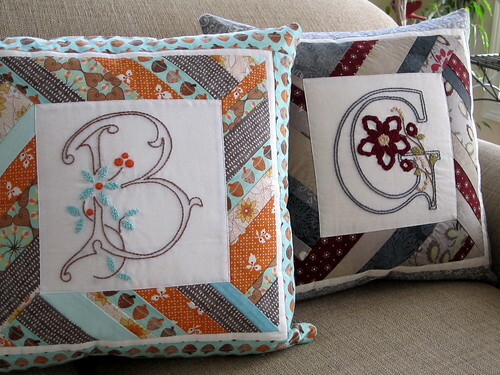 For both pillows, I used this tutorial for adding a zipper with a flap to conceal it on the back.